Except, um, so far as anyone has been able to prove, Comrade Khrushchev never said any such thing. The quote, which has been used by demagogues to equate liberal/progressive policies with communism ever since the early 1960s, doesn't appear in Khrushchev's writings or in the transcripts of any of his speeches, and the only individual who ever claimed to have witnessed the utterance firsthand, Ezra Taft Benson (see update below), gave contradictory accounts of where and when the words were supposedly spoken. We have searched the Legislative Reference Service files, checked all the standard reference works on quotations by Khrushchev, and consulted with the Slavic division of the Library of Congress, the Department of State, and the US Information Agency, in an attempt to determine the authenticity of this quotation. From none of these sources were we able to produce evidence that Khrushchev actually made such a statement. Be that as it may, the quote was widely disseminated during the early 1960s via the preferred viral medium of the day, postcards. One well-known purveyor of such literature was a southern California banker named Joe Crail, who, according to author Rick Perlstein (Before the Storm: Barry Goldwater and the Unmaking of the American Consensus, New York: Hill and Wang, 2002) distributed as many as two million pieces of far-right propaganda in 1961 alone (much of it, apparently, to his own clientele at Coast Federal Savings and Loan). "In a typical blitz," Perlstein writes, "account holders received a red postcard bearing a spurious quote from Khrushchev: 'We cannot expect the Americans to jump from capitalism to communism, but we can assist their elected leaders in giving Americans small doses of socialism, until they suddenly awake to find they have communism.'" When pressed by Senator Lee Metcalf of Montana to provide a source for the quote in 1962, Crail admitted he could not. The mailings were discontinued. According to Paul F. Boller and John H. George, authors of They Never Said It: A Book of Fake Quotes, Misquotes, and Misleading Attributions (Oxford, 1989), the quote was, in fact, a "deliberate fabrication of some radical rightists in this country, who thought it summed up Khrushchev's attitude" (which it actually did not — like most Marxists of his time, Khrushchev believed the capitalist system was inherently unjust and unstable and doomed to collapse of its own accord). Yet here it is, that same misbegotten quote, still in use some 50 years later, the only difference being that now we're supposed to believe it sums up the political philosophy and agenda of liberal Democrat Barack Obama. I have personally witnessed the heart-rending results of the loss of freedom. I have talked face-to-face with the godless Communist leaders. It may surprise you to learn that I was host to Mr. Khrushchev for a half-day when he visited the United States. Not that I'm proud of it. I opposed his coming then, and I still feel it was a mistake to welcome this atheistic murderer as a state visitor. "You Americans are so gullible. No, you won't accept communism outright. But we'll keep feeding you small doses of socialism until you finally wake up and find you already have communism. We won't have to fight you; we'll so weaken your economy until you fall like overripe fruit into our hands." Unfortunately, Mr. Benson — an anti-Communist zealot who claimed the U.S. government was permeated with Reds and the Civil Rights movement was a Commie plot to destroy America from within, etc. — isn't the reliable witness he may seem. In his writings and public statements he gave conflicting accounts of the provenance of Khrushchev's statement. Benson's meeting with Khrushchev took place in 1959. Did he forget, when he wrote the book in 1962, that the Soviet leader had uttered those words in his own presence? Or was his claim in 1966 that Khrushchev had spoken them to him directly a misremembrance, or an embellishment? Which version of events are we to accept as true? In any event, there's no record of Benson taking personal credit for the quote prior to 1966, by which time it had already been in circulation for at least six years, accompanied by the standard Khrushchev-said-this-a-few-months-before-coming-to-the-U.S. preamble. 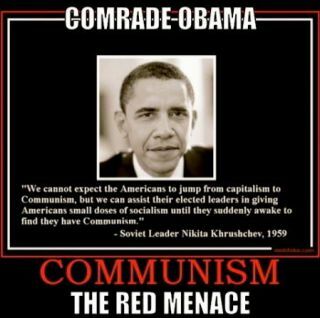 Three months before his last visit to this country, Nikita Khrushchev said, "We can't expect the American people to jump from capitalism to communism, but we can assist their elected leaders in giving them small doses of socialism, until they awaken one day to find they have communism." Did Reagan cite Benson as its source? No. Did he say Khrushchev had uttered the words to an American official on American soil? No. According to Reagan (and many others) in 1961 (and afterward): Khrushchev said it three months before he visited the U.S. in 1959. According to Benson in 1962: Khrushchev is reported to have said it a few months before visiting the U.S. in 1959. According to Benson in 1966: Khrushchev said it in Benson's presence while visiting the U.S. in 1959. Or, perhaps, he never said any such thing at all. Benson, Ezra Taft. "Our Immediate Responsibility." Speech delivered at Brigham Young University, 25 October 1966 (via LatterDayConservative.com). Benson, Ezra Taft. The Red Carpet: Socialism -- The Royal Road to Communism (Bookcraft, 1962), p. 65. Boller, Paul F. and George, John H. They Never Said It: A Book of Fake Quotes, Misquotes, and Misleading Attributions (Oxford, 1989), pp. 59-60. Reagan, Ronald. A Time for Choosing: The Speeches of Ronald Reagan, 1961-1982 (Regnery, 1983), p. 25. "Right-Wingers Hit on 'Quote' by Khrushchev." Los Angeles Times, 9 March 1962, p. 24. Udall, Morris K. "Khrushchev Could Have Said It." The New Republic, 7 May 1962, pp. 14-15. Did Julius Caesar Really Say That Thing About "Drums of War"?